This article is about the part of a plant. For other uses, see Root (disambiguation). In vascular plants, the root is the organ of a plant that typically lies below the surface of the soil. Roots can also be aerial or aerating, that is, growing up above the ground or especially above water. Furthermore, a stem normally occurring below ground is not exceptional either (see rhizome). Therefore, the root is best defined as the non-leaf, non-nodes bearing parts of the plant's body. However, important internal structural differences between stems and roots exist. The fossil record of roots—or rather, infilled voids where roots rotted after death—spans back to the late Silurian, about 430 million years ago. Their identification is difficult, because casts and molds of roots are so similar in appearance to animal burrows. They can be discriminated using a range of features. vegetative reproduction and competition with other plants. In response to the concentration of nutrients, roots also synthesise cytokinin, which acts as a signal as to how fast the shoots can grow. Roots often function in storage of food and nutrients. The roots of most vascular plant species enter into symbiosis with certain fungi to form mycorrhizae, and a large range of other organisms including bacteria also closely associate with roots. Perhaps the most striking characteristic of roots (that makes it distinguishable from other plant organs such as stem-branches and leaves) is that, roots have an endogenous origin, i.e. it originates and develops from an inner layer of the mother axis (Such as Pericycle). Whereas Stem-branching and leaves (those develop as buds) are exogenous, i.e. start to develop from the cortex, an outer layer. In its simplest form, the term root architecture refers to the spatial configuration of a plant’s root system. This system can be extremely complex and is dependent upon multiple factors such as the species of the plant itself, the composition of the soil and the availability of nutrients. The configuration of root systems serves to structurally support the plant, compete with other plants and for uptake of nutrients from the soil. Roots grow to specific conditions, which, if changed, can impede a plant's growth. For example, a root system that has developed in dry soil may not be as efficient in flooded soil, yet plants are able to adapt to other changes in the environment, such as seasonal changes. Branch magnitude: the number of links (exterior or interior). Link length: the distance between branches. Root angle: the radial angle of a lateral root’s base around the parent root’s circumference, the angle of a lateral root from its parent root, and the angle an entire system spreads. Link radius: the diameter of a root. Auxin – Auxin promotes root initiation, root emergence and primary root elongation. Cytokinins – Cytokinins regulate root apical meristem size and promote lateral root elongation. Gibberellins – Together with ethylene they promote crown primordia growth and elongation. Together with auxin they promote root elongation. Gibberellins also inhibit lateral root primordia initiation. Ethylene – Ethylene promotes crown root formation. Early root growth is one of the functions of the apical meristem located near the tip of the root. The meristem cells more or less continuously divide, producing more meristem, root cap cells (these are sacrificed to protect the meristem), and undifferentiated root cells. The latter become the primary tissues of the root, first undergoing elongation, a process that pushes the root tip forward in the growing medium. Gradually these cells differentiate and mature into specialized cells of the root tissues. Growth from apical meristems is known as primary growth, which encompasses all elongation. Secondary growth encompasses all growth in diameter, a major component of woody plant tissues and many nonwoody plants. For example, storage roots of sweet potato have secondary growth but are not woody. 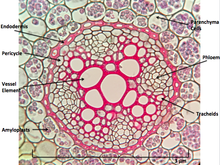 Secondary growth occurs at the lateral meristems, namely the vascular cambium and cork cambium. The former forms secondary xylem and secondary phloem, while the latter forms the periderm. 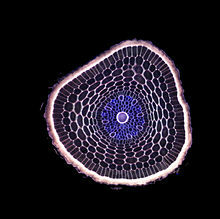 In plants with secondary growth, the vascular cambium, originating between the xylem and the phloem, forms a cylinder of tissue along the stem and root. The vascular cambium forms new cells on both the inside and outside of the cambium cylinder, with those on the inside forming secondary xylem cells, and those on the outside forming secondary phloem cells. As secondary xylem accumulates, the "girth" (lateral dimensions) of the stem and root increases. As a result, tissues beyond the secondary phloem including the epidermis and cortex, in many cases tend to be pushed outward and are eventually "sloughed off" (shed). At this point, the cork cambium begins to form the periderm, consisting of protective cork cells containing suberin. In roots, the cork cambium originates in the pericycle, a component of the vascular cylinder. The vascular cambium produces new layers of secondary xylem annually. The xylem vessels are dead at maturity but are responsible for most water transport through the vascular tissue in stems and roots. Tree roots usually grow to three times the diameter of the branch spread, only half of which lie underneath the trunk and canopy. The roots from one side of a tree usually supply nutrients to the foliage on the same side. Some families however, such as Sapindaceae (the maple family), show no correlation between root location and where the root supplies nutrients on the plant. There is a correlation of roots using the process of plant perception to sense their physical environment to grow, including the sensing of light, and physical barriers. Over time, roots can crack foundations, snap water lines, and lift sidewalks. Research has shown that roots have ability to recognize 'self' and 'non-self' roots in same soil environment. The correct environment of air, mineral nutrients and water directs plant roots to grow in any direction to meet the plant's needs. Roots will shy or shrink away from dry or other poor soil conditions. Gravitropism directs roots to grow downward at germination, the growth mechanism of plants that also causes the shoot to grow upward. Fluorescent imaging of an emerging lateral root. In order to avoid shade, plants utilize a shade avoidance response. When a plant is under dense vegetation, the presence of other vegetation nearby will cause the plant to avoid lateral growth and experience an increase in upward shoot, as well as downward root growth. In order to escape shade, plants adjust their root architecture, most notably by decreasing the length and amount of lateral roots emerging from the primary root. Experimentation of mutant variants of Arabidospis thaliana found that plants sense the Red to Far Red light ratio that enters the plant through photoreceptors known as phytochromes. Nearby plant leaves will absorb red light and reflect far- red light which will cause the ratio red to far red light to lower. The phytochrome PhyA that senses this Red to Far Red light ratio is localized in both the root system as well as the shoot system of plants, but through knockout mutant experimentation, it was found that root localized PhyA does not sense the light ratio, whether directly or axially, that leads to changes in the lateral root architecture. Research instead found that shoot localized PhyA is the phytochrome responsible for causing these architectural changes of the lateral root. Research has also found that phytochrome completes these architectural changes through the manipulation of auxin distribution in the root of the plant. When a low enough Red to Far Red ratio is sensed by PhyA, the phyA in the shoot will be mostly in its active form. In this form, PhyA stabilize the transcription factor HY5 causing it to no longer be degraded as it is when phyA is in its inactive form. This stabilized transcription factor is then able to be transported to the roots of the plant through the phloem, where it proceeds to induce its own transcription as a way to amplify its signal. In the roots of the plant HY5 functions to inhibit an auxin response factor known as ARF19, a response factor responsible for the translation of PIN3 and LAX3, two well known auxin transporting proteins. Thus, through manipulation of ARF19, the level and activity of auxin transporters PIN3 and LAX3 is inhibited. Once inhibited, auxin levels will be low in areas where lateral root emergence normally occurs, resulting in a failure for the plant to have the emergence of the lateral root primordium through the root pericycle. With this complex manipulation of Auxin transport in the roots, lateral root emergence will be inhibited in the roots and the root will instead elongate downwards, promoting vertical plant growth in an attempt to avoid shade. Research of Arabidopsis has led to the discovery of how this auxin mediated root response works. In an attempt to discover the role that phytochrome plays in lateral root development, Salisbury et al. (2007) worked with Arabidopsis thaliana grown on agar plates. Salisbury et al. used wild type plants along with varying protein knockout and gene knockout Arabidopsis mutants to observe the results these mutations had on the root architecture, protein presence, and gene expression. To do this, Salisbury et al. used GFP fluorescence along with other forms of both macro and microscopic imagery to observe any changes various mutations caused. From these research, Salisbury et al. were able to theorize that shoot located phytochromes alter auxin levels in roots, controlling lateral root development and overall root architecture. In the experiments of van Gelderen et al. (2018), they wanted to see if and how it is that the shoot of Arabidopsis thaliana alters and affects root development and root architecture. To do this, they took Arabidopsis plants, grew them in agar gel, and exposed the roots and shoots to separate sources of light. From here, they altered the different wavelengths of light the shoot and root of the plants were receiving and recorded the lateral root density, amount of lateral roots, and the general architecture of the lateral roots. To identify the function of specific photoreceptors, proteins, genes, and hormones, they utilized various Arabidopsis knockout mutants and observed the resulting changes in lateral roots architecture. Through their observations and various experiments, van Gelderen et al. 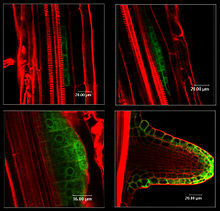 were able to develop a mechanism for how root detection of Red to Far-red light ratios alter lateral root development. the diffuse root system: the primary root is not dominant; the whole root system is fibrous and branches in all directions. Most common in monocots. The main function of the fibrous root is to anchor the plant. The roots, or parts of roots, of many plant species have become specialized to serve adaptive purposes besides the two primary functions[clarification needed], described in the introduction. 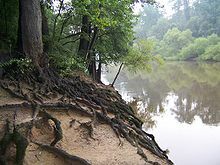 Adventitious roots arise out-of-sequence from the more usual root formation of branches of a primary root, and instead originate from the stem, branches, leaves, or old woody roots. They commonly occur in monocots and pteridophytes, but also in many dicots, such as clover (Trifolium), ivy (Hedera), strawberry (Fragaria) and willow (Salix). Most aerial roots and stilt roots are adventitious. In some conifers adventitious roots can form the largest part of the root system. Aerating roots (or knee root or knee or pneumatophores or Cypress knee): roots rising above the ground, especially above water such as in some mangrove genera (Avicennia, Sonneratia). In some plants like Avicennia the erect roots have a large number of breathing pores for exchange of gases. Aerial roots: roots entirely above the ground, such as in ivy (Hedera) or in epiphytic orchids. Many aerial roots are used to receive water and nutrient intake directly from the air - from fogs, dew or humidity in the air. Some rely on leaf systems to gather rain or humidity and even store it in scales or pockets. Other aerial roots, such as mangrove aerial roots, are used for aeration and not for water absorption. 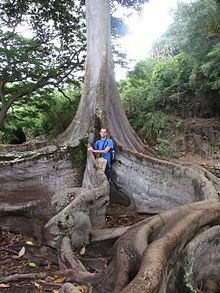 Other aerial roots are used mainly for structure, functioning as prop roots, as in maize or anchor roots or as the trunk in strangler fig. In some Epiphytes - plants living above the surface on other plants, aerial roots serve for reaching to water sources or reaching the surface, and then functioning as regular surface roots. Contractile roots: these pull bulbs or corms of monocots, such as hyacinth and lily, and some taproots, such as dandelion, deeper in the soil through expanding radially and contracting longitudinally. They have a wrinkled surface. Coarse roots: roots that have undergone secondary thickening and have a woody structure. These roots have some ability to absorb water and nutrients, but their main function is transport and to provide a structure to connect the smaller diameter, fine roots to the rest of the plant. Fine roots: typically primary roots <2 mm diameter that have the function of water and nutrient uptake. They are often heavily branched and support mycorrhizas. These roots may be short lived, but are replaced by the plant in an ongoing process of root 'turnover'. Haustorial roots: roots of parasitic plants that can absorb water and nutrients from another plant, such as in mistletoe (Viscum album) and dodder. 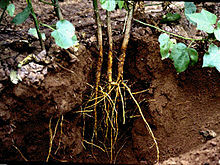 Propagative roots: roots that form adventitious buds that develop into aboveground shoots, termed suckers, which form new plants, as in Canada thistle, cherry and many others. Proteoid roots or cluster roots: dense clusters of rootlets of limited growth that develop under low phosphate or low iron conditions in Proteaceae and some plants from the following families Betulaceae, Casuarinaceae, Elaeagnaceae, Moraceae, Fabaceae and Myricaceae. Storage roots: these roots are modified for storage of food or water, such as carrots and beets. 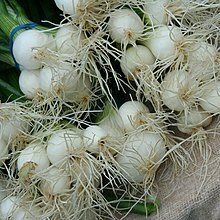 They include some taproots and tuberous roots. Structural roots: large roots that have undergone considerable secondary thickening and provide mechanical support to woody plants and trees. Surface roots: these proliferate close below the soil surface, exploiting water and easily available nutrients. Where conditions are close to optimum in the surface layers of soil, the growth of surface roots is encouraged and they commonly become the dominant roots. Tuberous roots: fleshy and enlarged lateral roots for food or water storage, e.g. sweet potato. A type of storage root distinct from taproot. The distribution of vascular plant roots within soil depends on plant form, the spatial and temporal availability of water and nutrients, and the physical properties of the soil. The deepest roots are generally found in deserts and temperate coniferous forests; the shallowest in tundra, boreal forest and temperate grasslands. The deepest observed living root, at least 60 metres below the ground surface, was observed during the excavation of an open-pit mine in Arizona, USA. Some roots can grow as deep as the tree is high. The majority of roots on most plants are however found relatively close to the surface where nutrient availability and aeration are more favourable for growth. Rooting depth may be physically restricted by rock or compacted soil close below the surface, or by anaerobic soil conditions. Certain plants, namely Fabaceae, form root nodules in order to associate and form a symbiotic relationship with nitrogen-fixing bacteria called rhizobia. Due to the high energy required to fix nitrogen from the atmosphere, the bacteria take carbon compounds from the plant to fuel the process. In return, the plant takes nitrogen compounds produced from ammonia by the bacteria. The term root crops refers to any edible underground plant structure, but many root crops are actually stems, such as potato tubers. Edible roots include cassava, sweet potato, beet, carrot, rutabaga, turnip, parsnip, radish, yam and horseradish. Spices obtained from roots include sassafras, angelica, sarsaparilla and licorice. Sugar beet is an important source of sugar. Yam roots are a source of estrogen compounds used in birth control pills. The fish poison and insecticide rotenone is obtained from roots of Lonchocarpus spp. Important medicines from roots are ginseng, aconite, ipecac, gentian and reserpine. Several legumes that have nitrogen-fixing root nodules are used as green manure crops, which provide nitrogen fertilizer for other crops when plowed under. Specialized bald cypress roots, termed knees, are sold as souvenirs, lamp bases and carved into folk art. Native Americans used the flexible roots of white spruce for basketry. 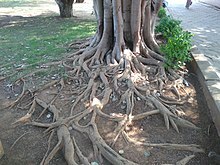 Tree roots can heave and destroy concrete sidewalks and crush or clog buried pipes. The aerial roots of strangler fig have damaged ancient Mayan temples in Central America and the temple of Angkor Wat in Cambodia. Trees stabilize soil on a slope prone to landslides. The root hairs work as an anchor on the soil. Vegetative propagation of plants via cuttings depends on adventitious root formation. Hundreds of millions of plants are propagated via cuttings annually including chrysanthemum, poinsettia, carnation, ornamental shrubs and many houseplants. Roots can also protect the environment by holding the soil to reduce soil erosion. This is especially important in areas such as sand dunes. Mycorrhiza – root symbiosis in which individual hyphae extending from the mycelium of a fungus colonize the roots of a host plant. ^ Retallack, G. J. (1986). "The fossil record of soils" (PDF). In Wright, V. P. (ed.). Paleosols: their Recognition and Interpretation. Oxford: Blackwell. pp. 1–57. Archived (PDF) from the original on 2017-01-07. ^ Hillier, R.; Edwards, D.; Morrissey, L.B. (2008). "Sedimentological evidence for rooting structures in the Early Devonian Anglo–Welsh Basin (UK), with speculation on their producers". Palaeogeography, Palaeoclimatology, Palaeoecology. 270 (3–4): 366–380. doi:10.1016/j.palaeo.2008.01.038. ^ Malamy, J. E. (2005). "Intrinsic and environmental response pathways that regulate root system architecture". Plant, Cell & Environment. 28: 67–77. doi:10.1111/j.1365-3040.2005.01306.x. ^ a b Caldwell, M. M.; Dawson, T. E.; Richards, J. H. (1998). "Hydraulic lift: consequences of water efflux from the roots of plants". Oecologia. 113 (2): 151–161. Bibcode:1998Oecol.113..151C. doi:10.1007/s004420050363. PMID 28308192. ^ Fitter, A. H (1991). "The ecological significance of root system architecture: an economic approach". In Atkinson, D. (ed.). Plant Root Growth: An Ecological Perspective. Blackwell. pp. 229–243. ^ Malamy, J. E.; Ryan K. S. (2001). "Environmental regulation of lateral root initiation in Arabidopsis". Plant Physiology. 127 (3): 899–909. doi:10.1104/pp.010406. PMC 129261. PMID 11706172. ^ Russell, P.J. ; Hertz, P.E. ; McMillan, B. (2013). Biology: The Dynamic Science. Cengage Learning. p. 750. ISBN 978-1-285-41534-5. Archived from the original on 2018-01-21. Retrieved 2017-04-24. ^ Nakagawa, Y.; Katagiri, T.; Shinozaki, K.; Qi, Z.; Tatsumi, H.; Furuichi, T.; Kishigami, A.; Sokabe, M.; Kojima, I.; Sato, S.; Kato, T.; Tabata, S.; Iida, K.; Terashima, A.; Nakano, M.; Ikeda, M.; Yamanaka, T.; Iida, H. (2007). "Arabidopsis plasma membrane protein crucial for Ca2+ influx and touch sensing in roots". Proceedings of the National Academy of Sciences. 104 (9): 3639–3644. Bibcode:2007PNAS..104.3639N. doi:10.1073/pnas.0607703104. PMC 1802001. PMID 17360695. ^ HODGE, ANGELA (June 2009). "Root decisions". Plant, Cell & Environment. 32 (6): 628–640. doi:10.1111/j.1365-3040.2008.01891.x. ISSN 0140-7791. PMID 18811732. ^ Carminati, Andrea; Vetterlein, Doris; Weller, Ulrich; Vogel, Hans-Jörg; Oswald, Sascha E. (2009). "When roots lose contact". Vadose Zone Journal. 8 (3): 805–809. doi:10.2136/vzj2008.0147. ^ Chen, Rosen & Masson, 1999, p. 343. ^ a b c d e Salisbury, Frances J.; Hall, Anthony; Grierson, Claire S.; Halliday, Karen J. (2007-04-05). "Phytochrome coordinates Arabidopsis shoot and root development". The Plant Journal. 50 (3): 429–438. doi:10.1111/j.1365-313x.2007.03059.x. ISSN 0960-7412. ^ a b c d e Gelderen, Kasper van; Kang, Chiakai; Paalman, Richard; Keuskamp, Diederik; Hayes, Scott; Pierik, Ronald (2018-01-01). "Far-Red Light Detection in the Shoot Regulates Lateral Root Development through the HY5 Transcription Factor". The Plant Cell. 30 (1): 101–116. doi:10.1105/tpc.17.00771. PMC 5810572. PMID 29321188. ^ a b Nowak, Edward J.; Martin, Craig E. (1997). "Physiological and anatomical responses to water deficits in the CAM epiphyte Tillandsia ionantha (Bromeliaceae)". International Journal of Plant Sciences. 158 (6): 818–826. doi:10.1086/297495. JSTOR 2475361. ^ Pütz, Norbert (2002). "Contractile roots". In Waisel Y.; Eshel A.; Kafkafi U. (eds.). Plant roots: The hidden half (3rd ed.). New York: Marcel Dekker. pp. 975–987. ^ Canadell, J.; Jackson, R. B.; Ehleringer, J. B.; Mooney, H. A.; Sala, O. E.; Schulze, E.-D. (December 3, 2004). "Maximum rooting depth of vegetation types at the global scale". Oecologia. 108 (4): 583–595. Bibcode:1996Oecol.108..583C. doi:10.1007/BF00329030. PMID 28307789. ^ Stonea, E. L.; P. J. Kaliszb (1 December 1991). "On the maximum extent of tree roots". Forest Ecology and Management. 46 (1–2): 59–102. doi:10.1016/0378-1127(91)90245-Q. ^ Postgate, J. (1998). Nitrogen Fixation (3rd ed.). Cambridge, UK: Cambridge University Press. Brundrett, M. C. (2002). "Coevolution of roots and mycorrhizas of land plants". New Phytologist. 154 (2): 275–304. doi:10.1046/j.1469-8137.2002.00397.x. Chen, R.; Rosen, E.; Masson, P. H. (1999). "Gravitropism in Higher Plants". Plant Physiology. 120 (2): 343–350. doi:10.1104/pp.120.2.343. PMC 1539215. PMID 11541950. – article about how the roots sense gravity. Coutts, M. P. (1987). "Developmental processes in tree root systems". Canadian Journal of Forest Research. 17 (8): 761–767. doi:10.1139/x87-122. Schenk, H. J.; Jackson, R. B. (2002). "The global biogeography of roots". Ecological Monographs. 72 (3): 311–328. doi:10.2307/3100092. JSTOR 3100092. Sutton, R. F.; Tinus, R. W. (1983). "Root and root system terminology". Forest Science Monograph. 24: 137. Phillips, W. S. (1963). "Depth of roots in soil". Ecology. 44 (2): 424. doi:10.2307/1932198. JSTOR 1932198. Caldwell, M. M., Dawson, T. E., & Richards, J. H. (1998). Hydraulic lift: consequences of water efflux from the roots of plants. Oecologia, 113(2), 151-161. 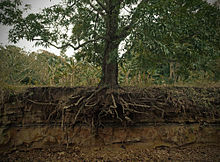 Wikimedia Commons has media related to Roots.